I am a young laboratory scientist studying antibiotic-resistant bacterial infections, and I want to tell you the story of how I realised that laboratory scientists will NOT solve the antibiotic resistance crisis. As an aspiring medical student, I spent one summer of my undergraduate career as a delirium prevention volunteer at a hospital in Pennsylvania, USA. While making rounds in the cardiovascular post-operative ward, I gained great insight into hospital practice - and how many patients are threatened by antibiotic resistance. When checking in on my patients each morning shift, I couldn’t help but notice how many names on the ward roster were annotated with symbols for drug-resistant infections - V for vancomycin-resistant Enterococci (VRE), S for Staphylococcus aureus (often methicillin- or multi-drug-resistant, a.k.a. MRSA), E for Enterobacteriaciae (typically beta-lactam or carbapenem-resistant, a.k.a. CRE), etc. Among a population of elderly patients, most of whom were preparing for or recovering from heart surgery, this was particularly unsettling. One afternoon, I checked in on one of the patients assigned to my rounds whose open door was affixed with a white sign reading ‘Contact Precautions’ – which is hospital administrator code for ‘Clostridium difficile’. I peeked in to see the patient being examined by at least three caregivers, and I breathed a sigh of relief. I wouldn’t have to put on a gown and gloves to undertake my two-minute chat, so I started back into the hallway. To my surprise, a janitor scurried in and began to furiously mop much of the unoccupied floor space - no gown, no gloves, and no change of mop. Before I could quite comprehend what was happening, he had left the room and rounded the corner to clean the room next door. The caregivers attending the patient didn’t say a word. They didn’t even notice. It should come as no surprise that the next day there was another white ‘Contact Precautions’ sign outside the room next door. Sitting back and hoping for a miracle to come around will only make the epidemic worse. This crisis is all of ours to solve. So let’s all solve it together. Hospital-acquired bacteria cause some of the most terrifying and difficult to treat antibiotic-resistant infections, and my experience showcased how easily they are spread. The high concentrations of antibiotics used to treat and prevent infections certainly contribute to the evolution of resistance, but the flurry of activity and high patient turnover rate can make controlling the spread of these diseases incredibly difficult. The numbers reflect this. The Center for Disease Control and Prevention (CDC) reports that roughly 1.7 million healthcare-acquired infections (HAI’s) occur in the United States each year, with as many as one-quarter of such infections in acute-care hospitals caused by one of the multi drug-resistant ESKAPE bacterial species: Enterococcus faecium, Staphylococcus aureus, Klebsiella pneumoniae, Acinetobacter baumannii, Pseudomonas aeruginosa, and Enterobacter. To me, those data are scary. But not nearly as scary as the follow-up question: what are we going to do about it? Maybe the janitor did not understand the meaning of the ‘Contact Precautions’ sign. Retrain the custodial staff? Invest in more effective disinfectants? Perhaps the surgeons and nurses in that patient’s room were having too frantic a day to be aware of the rest of the room. Try to lighten their workload? Extensive prescription of antibiotics for hospital patients is known to kill off essential gut bacteria that can restrict the growth of C. difficile. Revise hospital policies on stewardship of antibiotics? The increase in epidemic strains of trehalose-metabolizing C. difficile in the United States has been reliably linked to the additive’s increased use in American foods. Petition our government to remove it from our diets? All of that is to manage one type of infection that is corollary to antibiotic resistance. 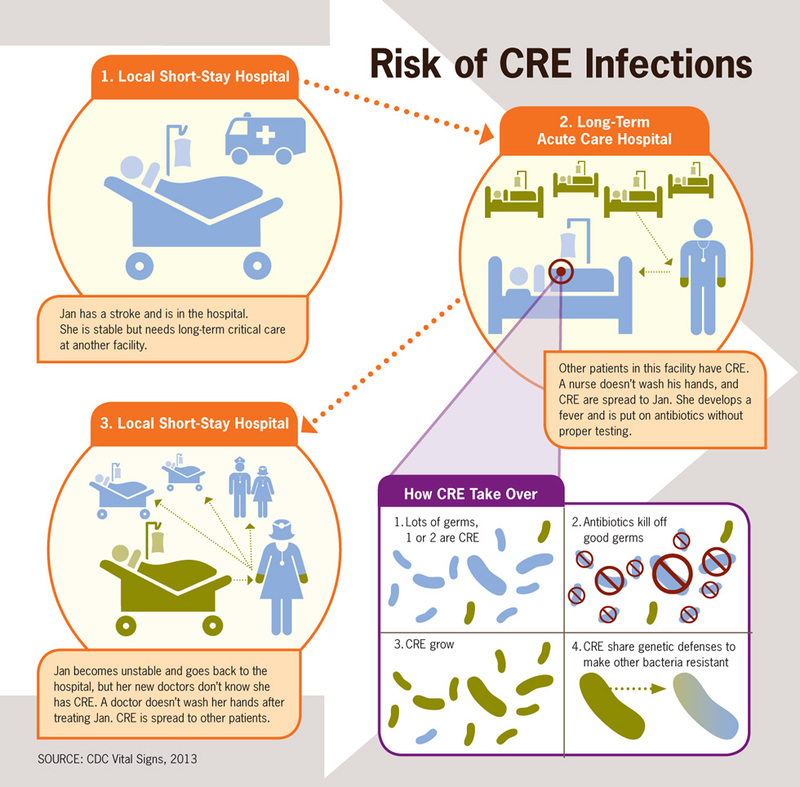 C. difficile infections tend to arise from prolonged use of antibiotics, rather than being resistant themselves. Now think of the dozens of drug-resistant bacterial species, the different types of infections they cause, the hundreds of resistance-encoding genes they can swap around at will… With bacteria wielding so many weapons, strategies to combat them venture outside of drug development and into the realms of antimicrobial stewardship, healthcare employee training, patient awareness, and funding for infection control. It doesn’t take long to connect this crisis to larger-scale issues like education, the national budget or health policy. One thing is clear: there is no single solution. Contributions from organizations like the Longitude Prize and the Gates Foundation are critical, but the battle we face is so great that we cannot win with a single solution. Rather than facing one single infectious agent, drug resistance has spread into many species of bacterial pathogens. Unlike previous epidemics, we cannot hope for the perfect answer to flow from the point of a syringe or dissolve out of a pill. Indeed, when those types of solutions were developed for smallpox, polio, and other infectious agents, it still took the support of governments, nonprofits, schools, private companies, hospitals - everyone - to support research, educate one another and distribute vaccines. If infection spreads because a custodian was not trained on the meaning of ‘Contact Precautions’, then we need an infection control specialist to help train the cleaning staff. If an elderly woman is too homebound to refill her prescription for doxycycline to treat an ongoing infection, then we need community leaders to help her get the medication she needs. If the development of new antibiotics is hindered by legislative or financial barriers, then we need politicians and business people to support this much-needed research. Yes, we need doctors, nurses, scientists, and pharmacists. But we also need schoolteachers. We need psychologists and sociologists. We need engineers and computer scientists. We need lawyers and small business owners, restaurateurs and interpreters. Daniel Evans is a Ph.D. student in microbiology and Immunology at the University of Pittsburgh School of Medicine in Pittsburgh, PA, USA. He can be found on Twitter here.